The MagEyes has been demonstrated to me, and I enthusiastically recommend this appliance. It appears to be effective, very simple to use, and very comfortable to wear . Most importantly, because it is an external optical device that does not come in contact with the eye itself, it is very safe to use. I took my mother to try on a pair of MagEyes. She has to wear very thick glasses, the thickest possible. When she tried them on, she turned to me and said, “Now I can see to cut my food. Do you know how that makes me feel?” Needless to say we both had tears in our eyes and so did the sales clerk. Thanks for sending the glasses right away. Mom can even read the comics now. She loves to read. Now she can watch TV and do close work more easily . For many years, I realized my daddy couldn't see like most people. He was told he was legally blind. He had the opportunity to try MagEyes. He used the stronger #4 lens and still used it with his glasses , but he was delighted, as it was the first time ever that he could hold his paper in both hands and read like most people in a normal, comfortable manner. I think MagEyes is a wonderfully creative idea . My mother will soon be 88 years old, in excellent health, but her eyesight is failing. When I was visiting her recently, she asked me to thread several needles for her in different colors of thread. She had some mending to do, but could not thread a needle. She will be able to thread a needle with MagEyes. My husband and I bought a set of MagEyes for his father who has macular degeneration . Well, he absolutely loves them and has gone back to one of his loves-reading! He's even buying books again! I guess there's no way to stop the aging process ut there's things that do help along the way – one of them being a set of MagEyes! Once again, thank you. My mother was able to see the needlehole of her sewing machine with the #7 lens – you can imagine her excitement & hope that she can get fitted with glasses to help her sew again. It seems that the “government run” optical place is telling her that her vision is too poor for glasses and they can't help!!! So much for government run health care. Hopefully, she will be able to go & get fitted by a private optician now that she has proof that this is not hopeless. Thank you for your product ! I thank you sincerely for your help. I do appreciate it. We met each other at the FTD (Fly Tackle Dealer) Show in Denver . I've tied on Saturday in the Umpqua booth some flies with your MagEyes. You have given this beautiful peace for some demonstration at the show. This is one of the best things that happened to me during the show. I really like it very much, very helpful to me when I am tying my flies. It works great . I've explained to you why and after more and more using it I know for sure that it should be used by more flytyers around the world . I'm really pleased with the glasses. They are exactly what I wanted. I had to tell you “thank you” for your MagEyes. After my father' recent stroke, he lost a large portion of his vision and had been unable to read. I sent him a pair of MagEyes and how his is able to read the newspaper again. Thanks to you, I was able to give this simple pleasure back to him again. For the past two months, I have been relying on my MagEyes for my work as a national teacher for the Embroiderer's Guild of America and very enthusiastic about how useful they are. I received my MagEyes just before leaving on a three week research trip to Great Britain , where I inspected and reviewed various collections of 17 th and 18 th century needlework in such places and the Victoria and Albert Museum in London and Burrell Museum in Glasgow , noting the fine stitching and construction techniques of that period. As an aid to the close viewing and counting of threads and stitches, the MagEyes were invaluable, since they allowed my hands to remain free to take notes. For my personal stitching, the MagEyes have allowed me to spend eight hours in a class doing the very exacting technique of Japanese silk embroidery without either the pressure of my glasses resting on my nose, and or having to take my glasses off during a break and having to hunt for them afterwards. As a teacher, I use them in my classes, when I must look over the shoulders of my students while they are stitching – a task that never seems to work for either bifocals or trifocals! I am enthusiastically recommending them to anyone who is an embroiderer. Love my MagEyes. It has helped me do much finer stitches when doing appliqué. Would recommend to anyone. MagEyes are great! 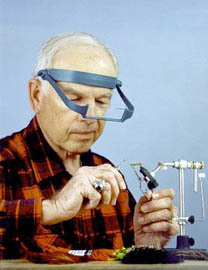 I've tried around the neck magnifiers, glasses (readers), hand held magnifiers, etc. I've never been able to keep the aid and my hands lined up correctly. MagEyes solves all these problems and doesn't create any new ones! Thank You! I'm very pleased. MagEyes has made my cross stitching much more enjoyable. So much so that I went and got another “just in case” and one for my housekeeper. Thank you very much for sending me a replacement lens for my MagEyes. That's the best invention since sliced bread! I've found them invaluable in intricate sewing and removing slivers. I know as time goes on I'll find many more uses. You have a great product going and I intend to broadcast the word. I am so excited about my MagEyes I can hardly stand it! Maybe the information in this letter can be used to encourage others who think they are doomed to never read well again. I had cataract surgery and the surgeon, through a series of stupid mistakes, ruined the cornea, tore the iris, messed up the trabicular meshwork in my right eye. Then, a much better surgeon did thousands of dollars worth of reconstruction and replaced my cornea with a cornea from a man who had died a few days before. For the next 20 months, I returned often to have stitches removed. Each time stitches were removed the eye reshaped itself and I had to have a new lens for the right side of my glasses. I think I had that done 6 times. I had to give up many activities that I had enjoyed and I can't drive at night because of the glare from headlights. I am almost 75 years old now and I bought MagEyes after seeing them advertised on “Texas Country Reporter” TV show based out of Dallas , TX . I only planned to use the #7 lens for threading needles and that sort of thing, but I had the #2 and #4 lenses and I quickly found that I could READ again!!!! Last week I went to see my therapeutic optometrist who checks my eyes every six months and I told him about my MagEyes and he explained how they worked and that they would NOT hurt my eyes or my vision, but that the correction in the MagEyes could not be incorporated into my glasses, that the distance between my eyes and the MagEyes was necessary. I will tell the opticians that I know about MagEyes and hope they tell their customers about them.